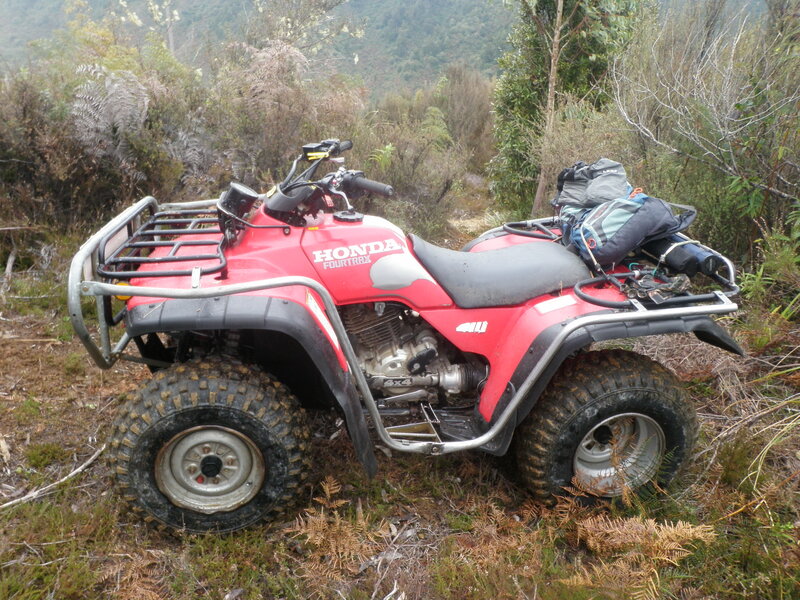 Hi guys, Sorry about lack of reports in the last week or so but have been doing my fair share of back country fishing between guiding on the Tongariro and working around some really nasty weather. Those of you who fished Saturday would have been pleased with the weather but any day 3 or 4 each side of that has just been horrible. 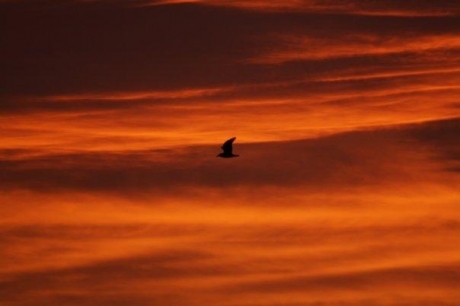 Tongariro national park and Napier Taupo roads have all been closed due to heavy rain, snow, land slips and winds up to 100km per hour which have put some fisherman back in the carÂ andin front of the fire. Just when you think spring is here and summerÂ just around the corner mother nature surprises everyone and wrecks plans. 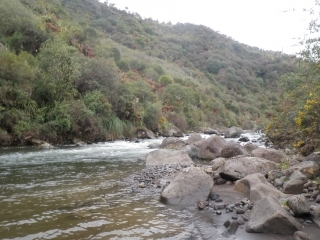 I have been fishing the headwaters of the Whanganuie only accessed by quad bike and even though very high and at times hard to wade it really produced some awesome fish with the best being a brown of about 6lb. The fish in here are in really good condition at the moment and would average 4lb with plenty which would go to about 5lb. They fight similar too many other back-country river fish with long strong runs and impressive acrobatic aerial displays which gives you a great look at what you have hooked. After fishing for spawning Tongariro fish you will really get a nice surprise when one of these trout pull all fly line from you and don’t look like stopping before snapping you off after running you around 2 or 3 rocks. 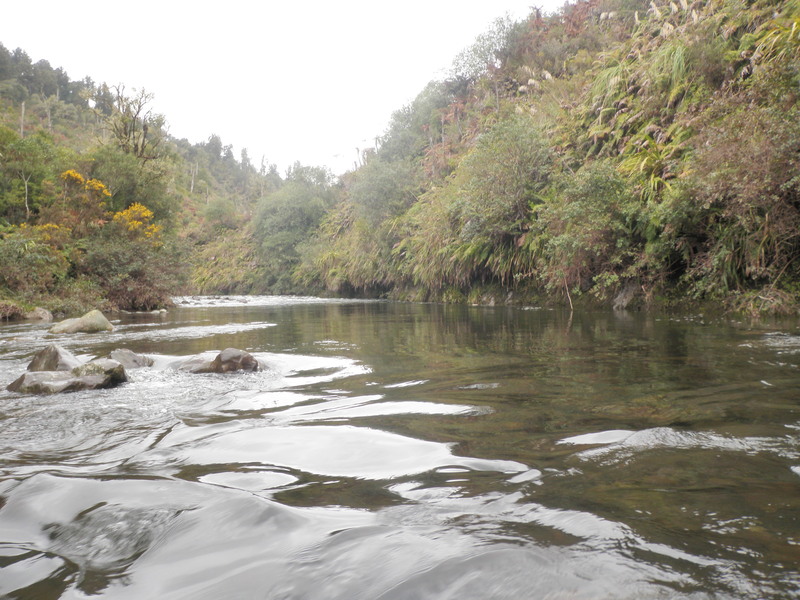 I fished this solo the other day and struggled to land many at all as chasing them down river is not an option with the Whanganuie being so slippery and no mate to help put them in the net as the banks are overgrown and hard to find a clear beach to put them on. If anyone is interested in going into this awesome fishery and having a fun filled day with quad bikes and large trout from untouched water give me a ring to get some details, you wont be disappointed. The Tongariro has not fired in the way I thought it might with all the rain but we have certainly seen enough fish in the system to be worth us going out andÂ trying our luck. I guided on Saturday morning and was able to get my clients on the water by 7am which enabled us to get first lines through spot x in the braids which has been fishing well of late. Tim who is on school holidays and is eleven years old demonstrated great casting skills for his age and he was the first one to put a fish on the bank by 7.15 impressing both me and his father. Ian his old man was next and it was not long before they were both hooked up and taking it turns going over the hot spot which in the end gave up 8 rainbows. Tim you are going to be a machine mate if you can fish like that 11 I would hate to think what you will be like in 2 years time if you stay out of trouble. Fish in the Tongariro have been a mixed bag really with fish quality and size , some of the jacks are starting to really colour up now and we are starting to seeÂ a few spent hens on their way home to the lake. The braids has fish in it every morning but some of you either head for the biggest deepest part of the river or walk straight through them in your quest to beat the next angler to your favourite spot. Fish in the braids at the moment are in the fast riffley water and all you need to do is walk very slowly with a pair of polaroids find your fish and present them with some lightly weighted nymphs, it’s easy! Mike has been out on the river again today with that horrible westerly wind and by lunch time he had reported in having ten fish in the net, this is pretty quiet for Mike. 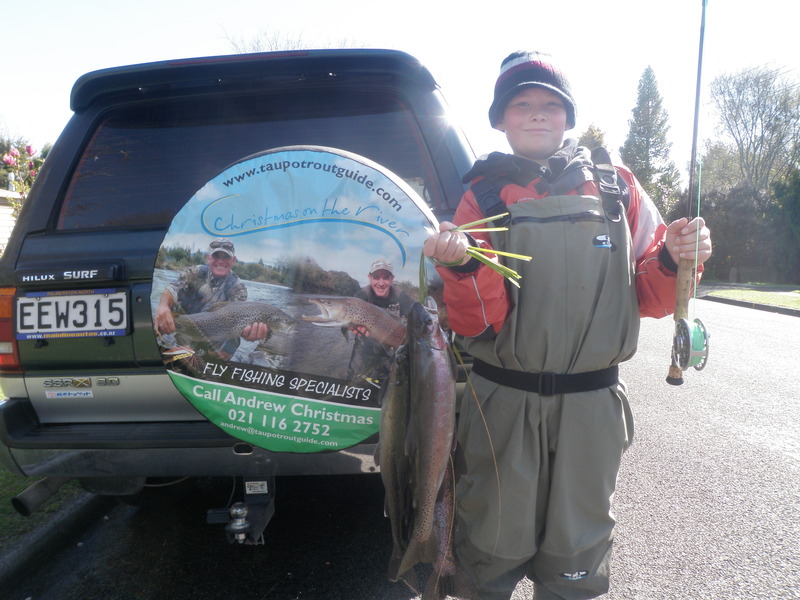 When I was on the river on Saturday we chatted with many angry fisherman which were moaning about the river having no fish until they watched Tim (11 years old) pulling fish out in front of them. The fishery is fine, there’s heaps of bloody fish in it just spend a little more time in places you wouldn’t usually fish or try changing your terminal tackle slightly and see if it makes a difference. Something else which is vital in my mind is getting up and making sure you are getting fresh water for the day as this will often see you hooked up in the first couple of casts taking the pressure of you. 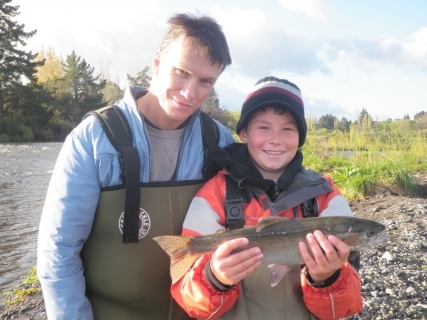 The Tongariro is famous for trout fishing in the winter and you must expect to enjoy the past time with others while fishing such a river, especially on a weekend in school holidays. Anglers which have managed to get up to Lake O generally have caughtÂ a fish or two but windy conditions have prevented many from getting to where they would like to be. If you can not get on the lake with the boat don’t forget about the canal as this can be very productive on bad days when it hasÂ a bit of dirty or high water in it. I spoke to Chris this morning and he said the road was also closed up to there but he had witnessed a rainbow of 8 lb getting landed in the inlet canal over the weekend caught on aÂ fly rod so that would have been nice to be that bloke, it was also released. Currently it is blowing here in Taupo really hard from the westÂ which should be pushing fish into the rivers such as the Waytahanuie and the Hine which will give anglers willing to face the elements good opportunities of fresh trout. All rivers should be running high at the moment and with the lake being fairly full they should remain high with good flow for a few days which will encourage extra fish into the cleaned out rivers. Conditions are not perfect but the effort I think will be rewarded to those who give it a go. Will get another report done during the week along with a pool report which can be viewed on Friday at TRM’s website which should give you lot enough reading if you don’t want to get out in the cold.